This post is a simple reminder to be kind to yourself & to others. Mental health is a complicated issue. So many people are struggling with depression, anxiety, etc. If we could all see mental health issues the same way we see a broken leg or an open wound I think things would be different. Many are seeking escape or relief in any way they can. They are fighting the best fight they can. Maybe you are fighting the best fight you can. So let’s practice kindness & empathy, for ourselves & for others. This post has been prompted by the loss of January Seraph, Michael Stone & Chester Bennington recently. This entry was posted in Other and tagged chester bennington, depression, january seraph, mental health, michael Stone by Mistress T. Bookmark the permalink. This is incredible sadness. All I can offer is in the memory of January, Michael and Chester is a wish for all of us to make a gesture to your neighbor or family or stranger near you to call on them and make a gesture of kindness to all. See if they need something ,even a phone call. Reach out with human kindness. You never know what a difference it could make. We are each other’s angels. I had a discussion with an industry friend just after amadahy took her own life. I said something something to the effect of, “it’s sad she couldn’t work through her mental illness.” My friend got really defensive and insisted she was not mentally ill. 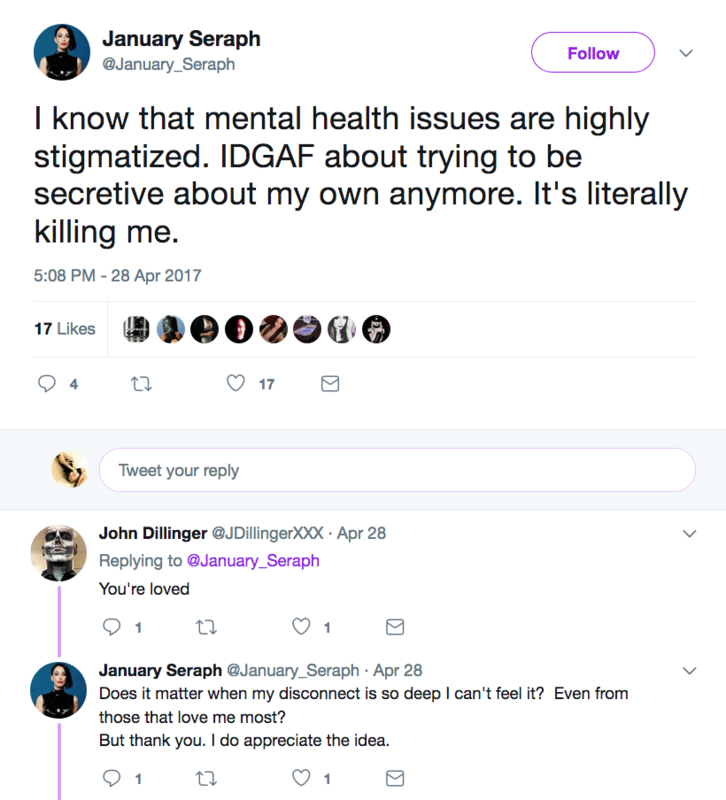 I didn’t know her, but I think by definition, committing suicide (as a young healthy person) means you were mentally ill. Maybe I’m wrong, I dunno. But what I took away from her reaction was that she thought I was putting my her down, implying she was crazy. This kind of stigma is scary. If we’re so scared of identifying an issue, calling it by name, lest we “insult” someone, it takes us further away from the solution. In August, 2011, my wife, Betty, was diagnosed with dementia. Almost all of our friends? immediately stopped calling or visiting. It was like she had Ebola. She died 10/05/2017. People can be very cruel about mental disease. I’m very sorry for your loss, of your wife & of your friends before that. Hi Mal, I am sorry you had to go through that. We went through something similar in our marriage, with all friends but one sort of staying away from us. Sorry you had to go through that. Peace and love to you sir! The kindness we give is the kindness we are. In the most challenging moments its not easy to practice your Zen. It is said that every crisis has it’s opportunity but that doesn’t mean we need to speak of such philosophies to someone so dear to us at any moment during their crisis just because we wish to instill some degree of hope and salvation. Perhaps consider the benefits of encouraging the “cyclical” five stages of grief as a healthy process. Maybe, and it’s still a maybe, we can Be The Love for someone. But, and this is important, Be The Love for yourself when you find yourself in your own darkness. I speak of the five stages of grief over and over in the face of skepticism because clinically and experientially it’s proven it’s self over and over again. There are no guarantees and I think this is where the skepticism exists. Human nature in despair craves the absolute due to the disparity. That there is no absolute strikes at the disparity. Vicious cycle, heavy on the vicious. The kindness we give is the kindness we are. In other words we can’t give away that which we are not true to ourselves. Kindness begins at home. Home is where the heart is. Give. Hi Mistress T, and other readers. I think part of the problem nowdays is our lack of time and energy to devote to keeping a healthy connection to others. Sometimes it seems like I catch myself and most of the people around me feeling like we have to do everything perfectly, and have nice things, and be special and worthwhile people. Rushing and being preoccupied with living well may not leave time for rejuvenation, relaxation, connecting with others. Plus I feel like being mean in speech and action gets to be more acceptable every day. However, the good news is that we all have the chance everyday to spread kindness, smiles, and forebearance for the little annoying and thoughtless things others do to us each day. You never know who you’re talking to — from a Tom Robbins book. As someone struggling with borderline personality disorder, depression and anxiety that recently had a hospitalization, this means a lot. Mental illness is absolutely something that needs to be talked about everywhere, especially in the adult & fetish industry and community. My brother has a mental disorder due to a childhood traumatic event, and now cannot control his anger. I’m one of the few people who can manage it and can see the good person he is when he is in control. Recently he’s been working on getting help after getting onto disability benefits. I wish the same could be said for me. I’ve had depression since about middle school, and have kept it secret and hidden because I didn’t want to burden my mom who was already dealing with my brother. I just pushed it off as a weird/dumb emotional puberty based phase I was going through, but I was wrong. At random moments, mostly when i’m alone, my mind wanders, debates the subject of mortality, the idea of value towards my existence, and weighs the pros and cons like an auction house. I can feel alone even when around friends. And it’s a terrible feeling I do not enjoy. I get through it as much as I can because of my friends that know about it, and my family. I draw to cope, and I write to express. When Chester left the world, my facebook homepage was filled with people exclaiming their disgust at his actions, for leaving his family behind with his “selfish” act. They don’t realize when you have depression, the world seems like fire, and you’ll do anything to escape. I feel sorrow for his family. But it’s an example of why I don’t speak of my depression to many. It’s just, something people don’t really understand that well. Thank you again for another insightful post. I’m sorry for my rambling.